Ram gave its lineup a dose of attitude last month in Detroit with the new 2015 Rebel. Now it’s bringing a touch of class and sophistication to the lineup in Chicago with the new 2015 Ram Laramie Limited. If there’s one word to sum up the new 2015 Ram Laramie Limited it’s this: bling. That’s right, all the bling. Like the Rebel, the Laramie Limited model ditches the traditional crosshair grille in favor of a billet setup with the word RAM proudly stamped across it. If anybody’s still confused as to what kind of truck you’re driving, the tailgate should clear things up, as it has a massive 20-inch-wide chrome RAM badge also stamped on it. Nobody’s going to mistake this truck for anything other than a Ram. For those seeking more flash an optional chrome front and rear bumper is available and replaces the standard body-colored front fascia and rear bumper. The body-side molding, mirrors, door handles, window molding, and wheel-to-wheel side steps add to the look. Rounding out the exterior package are 20-inch chrome wheels. Inside the Ram Laramie Limited features an all-black interior with full Black Natura Plus leather seating and real wood. It’s not just the seats that are leather. Many interior bits from the door trim and top of the door panels, to the A- and B-pillar handles are all covered in leather as well. Taken from the Longhorn model, the front seatbacks have flap-closure map pockets with chrome Ram-lettered buckles. The Laramie Limited comes standard with the next generation Uconnect infotainment system, featuring an 8.4-inch touchscreen and navigation. 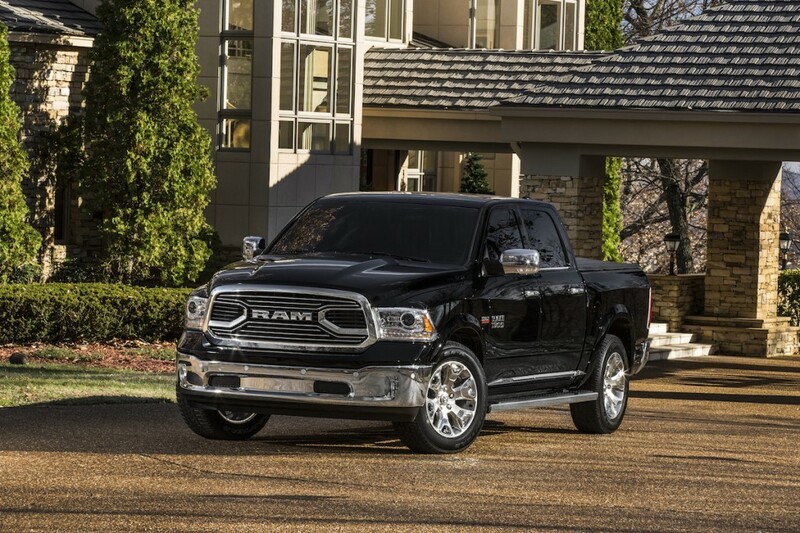 The background screens and surrounding bezel are specific to the high-class trim in the Ram lineup. As for models, the Laramie Limited trim is available in Ram 1500, Ram 2500, and Ram 3500 single- and dual-rear-wheel; Crew Cab and Mega Cab; four-wheel drive and two-wheel drive; and short- and long-wheelbase models. An air suspension comes standard on the Laramie Limited. Sales of the Ram 1500 Laramie Limited will in the second quarter of 2015, as a 2015 model, while the 2500 and 3500 models will be available in the third quarter, as 2016 models. Pricing will be set closer to the on-sale date.